The best value in 4K 55" TVs! Clean non-synthetic vitamins from a conscientious company! Lawn Universe puts the art in artificial lawn! USDA certified organic nutrition bar! "Hot Gear for Spring Break"
Bruce Pechman is America's Best-Built TV Technology & Fitness Personality appearing regularly on local and national TV shows. “Mr. Bicep” is also the most prolific major Consumer Technology & Health/Fitness Television Correspondent in the country and has made over 400 live TV appearances! Bruce will appear live on the Good Morning San Diego show. Bruce's segment theme will be "ElliptiGO Mountain Stand-Up Bicycle." Bruce appeared live on the Good Morning San Diego show. 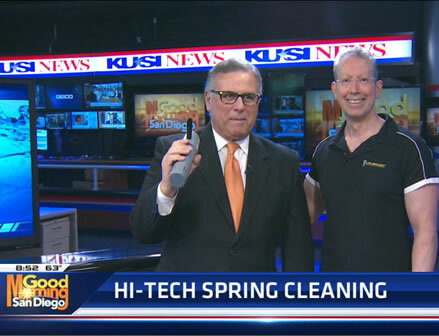 Bruce's segment theme was "Hi-Tech Spring Cleaning." Bruce appeared live on the Good Morning San Diego show. Bruce's segment theme was "Awesome Spring Fitness Gear."